The journal that makes the difference. Fast. I love this question because I so intimately understand it. In the past I always prided myself on being a do-er. I still love to check stuff off the list! While that can lead to a whole additional conversation around work patterns that hold you back, I’m not going there today. But what I will say, is that in the past I thought I was so busy, that there was no way I could be a “morning practice” kind of person. Sure, I had read the articles and watched the videos from people like Tony Robbins and Oprah about how it was essential. I had seen the many (so many) articles on Thrive Global about morning rituals. I knew it would be helpful. But I also knew I felt like I barely had time to make breakfast most days. As fortune would have it, though, in March of 2017 at a local networking event, a few women and I won a copy of journal that was a 100 day challenge. This journal was great, because it only had a few short questions that you were supposed to answer each morning and night to stay focused on your goals. Even better, though, I had a support group! Since a group of us had won the same journal, we vowed to do it together. We created a Facebook Messenger chain where we would update each other every day with a photo of our completed journal to stay accountable. After the 100 day challenge, I was hooked. The thing I loved most was that the journal was SHORT! I didn’t feel like I needed to add an extra hour to my day. I mean, eventually I did grow my morning practice and even added in meditation, but the benefits of the journaling alone were awesome! After the challenge ended, I knew I needed another quick and easy journal. I had my own blank journal for working on longer questions and exercises, but I wanted something simple that I could have on me at all times. I wanted something fast, so that even on days when I had friends in town or was rushing to get out the door, I could still do it. I researched, looked at all the Facebook ads for journals shown to me, and even printed out a PDF that I had designed. They were never quite right, though. Always a little bit too complicated. Enter, The Five Minute Journal. I finally found The Five Minute Journal a few months ago, and I am totally loving it! It has a couple of questions that you answer each morning and night, so that you can focus on gratitude and the right things in your day. I’ve been recommending it to clients, too. One of my clients is taking some of her time off before her new job starts to travel the world. How cool is that? And while she travels, she’s bringing along her Five Minute Journal. While she’ll be able to tune out and enjoy her time abroad, she’ll also be able to take a few minutes each day to come back to herself. I know that on vacations I can sometimes feel like I’m disconnected from real life, so it’s a simple way to keep on my good habits. This isn’t an ad, although they probably should sponsor me at this point. I just really believe in this product because I think it can make even the most busy of us take the time for a little morning ritual. It’s so important to start where you are. You can totally look to build an in depth morning practice that takes an extra hour of your time, but if you want to start small while having a big impact, why not make a little change that only takes a few minutes? I have this journal and a few other books as recommendations on my site, here. Do yourself a favor, and get on it. And while you’re getting started with your 5 minutes each day, I have a few recommendations. Because adjusting to new habits is always a challenge! Celebrate Successes. Having a group for accountability made my shift to journaling way easier to get used to. If you can’t find a group, though, start with celebrating! Set a goal for “x days in a row” to do your journal, and figure out what your reward will be. If you’re going to buy a new workout tank after a week of success, do it! Keep the journal in your line of sight. Put it on your bedside table and make it a rule. “First thing in the morning before I’m allowed to check my phone, I do my journal”. Easy! Pair it with something great. Pairing is an awesome technique popularized by Gretchen Rubin. 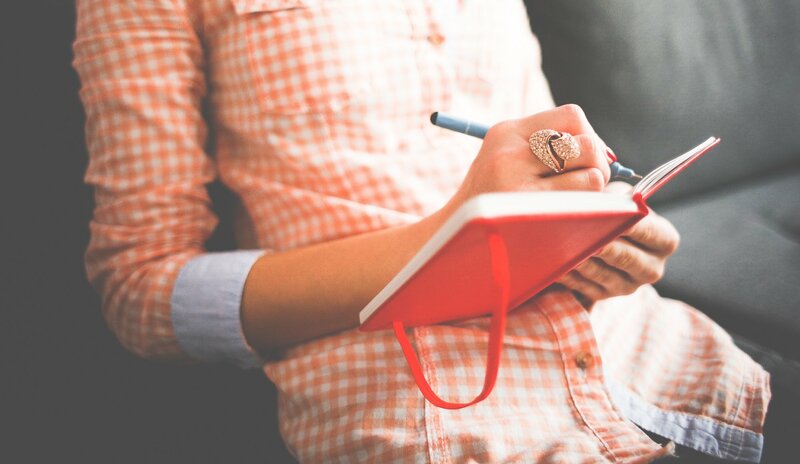 If you don’t want to make your journaling a rule first thing, try making it a part of your day you look forward to. When I do any longer-form journaling, I normally pair it with a coffee I’m looking forward to, or cozy time with my favorite blanket and our pup. Any way you slice it, morning habits don’t have to be hard. You don’t have to be Tim Ferris right away. You just have to build in a little more time than yesterday. Try out The Five Minute Journal and building in a little more time. I’d love to hear what works for you too, so if you’ve found other easy habits to implement, share them below! Small changes can add up to big results. If you’re looking to build a little more good into your day, you know where to find me.